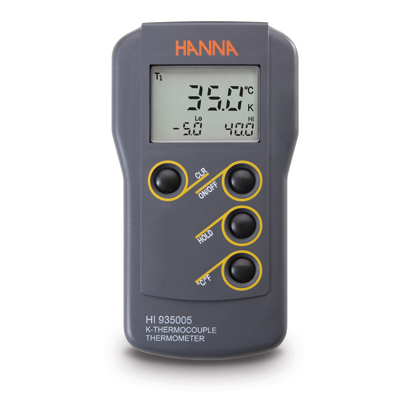 HI 935005 is a waterproof, K-type thermometer offering accurate temperature measurements in a wide range as well as a 1600 hours of battery life. This unit displays current temperature along with the minimum and maximum values achieved during the measuring session on the LCD. The HOLD button freezes the display to allow the user time to record readings. The °C/°F button switches between the Celsius and Fahrenheit temperature scale. The CLEAR button restarts the evaluation of high and low values. The instruments are equipped with BEPS (Battery Error Prevention System) which alerts the user in the event that low battery power could adversely affect readings. A wide variety of interchangeable probes are available to meet your specific needs. Optional rubber boots are available.